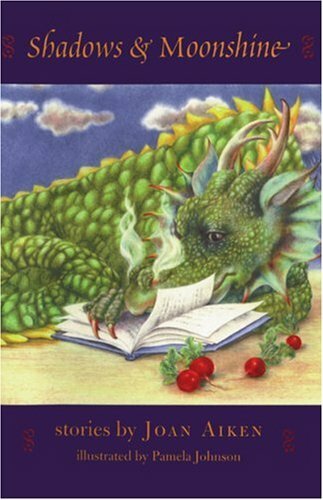 Amazon.com description: Product Description: The prose of Joan Aiken, her uncanny ability to tell a great story in language that is classically beautiful, her fascinating characters, riveting dialogue, and compelling action, should be better appreciated. Like her father, Conrad Aiken, she is adept at a number of forms but is a master of the short story. In this fetching collection of what she herself considers thirteen of her best tales, she can be scary (everyone knows her fascination with wolves and witches) and poetic (as in "Moonshine in the Mustard Pot" or "The Lilac in the Lake"). But whatever she sets her hand to, it reads like the work of a master. And set against the lovely and luminous pencil drawings of Pamela Johnson, we have a a baker's dozen of magical tales that will stay with readers long after the last page is turned and the lights turned out. from David R Godine Pub (May 30, 2008); titled "Shadows & Moonshine"
About: The prose of Joan Aiken, her uncanny ability to tell a great story in language that is classically beautiful, her fascinating characters, riveting dialogue, and compelling action, should be better appreciated.